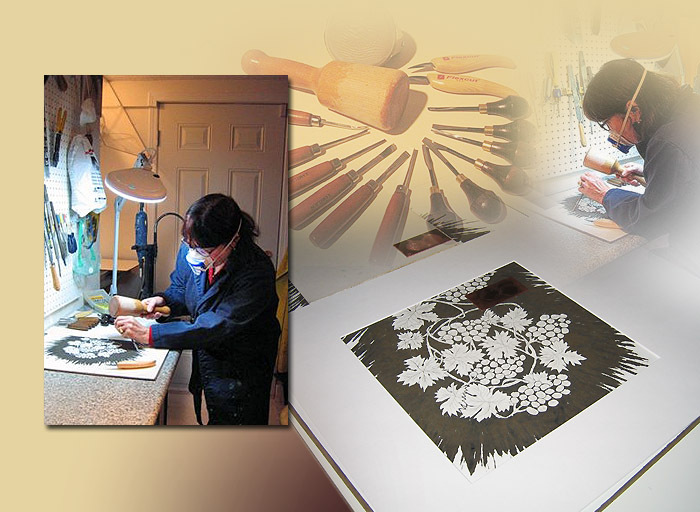 My woodcuts are prepared by using chisels, knives and hand drills. The negative space carved away creates the white or non printed areas. Woodcuts are a relief process where the raised surface containing the positive image is printed. I apply the ink to the surface with a roller or brush. The image is transferred to the paper by running the woodcut through the press or by hand. Some of my woodcuts are reduction woodcuts requiring many cuttings and printings of the altered states of the original image. These altered states can be printed in different colours. When the woodcuts are printed on damp paper with a heavier pressure applied by the press an embossed print is created. If Japanese rice paper or mulberry paper is used the image can be transferred by using the weight of the hand or even the back of a spoon. Generally the pressure used is light and the image is transferred to dry paper or material.